With almost two years since the introduction of the Insolvency and Bankruptcy Code, 2016 (“IBC” and “Code”), there have been various challenges in the effective implementation of the Code. However, constructive interpretation by the judiciary coupled with effective amendments to the Code have helped in eliminating many of these teething issues. The Insolvency and Bankruptcy Board of India (“IBBI”) which is the regulatory and supervisory body in charge of the IBC, has done a commendable job in proactively spreading awareness and regulating the space. Many important judgments were pronounced throughout the year, including certain landmark cases, where the Supreme Court has tried to ensure that the spirit of the Code is given primacy over procedural requirements. With multiple assets on sale, strategic investors have been first off the mark, with billion dollar conglomerates trying to outbid each other and add coveted companies to their inventories. The interest shown by corporate India in turning around loss making industries is extremely encouraging for the economy as well as the NPA laden banking system. With so many important developments during the course of the year, we have tried to capture them all in the following sections, which will primarily deal with (i) Impact on Creditors and Investors, (ii) Statutory and Regulatory Developments and (iii) Judicial Developments. A. Empirical Data – Better Realization Through IBC! 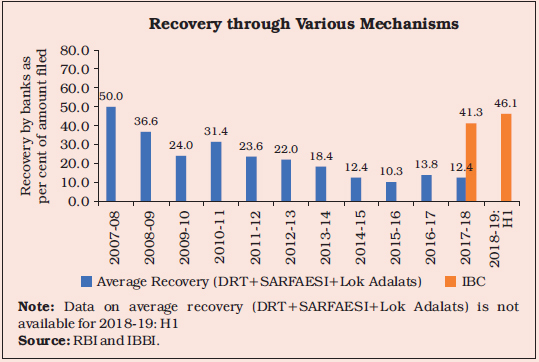 A recent report by the Reserve Bank of India on the trends and progress of banking in India 2017-18, has shown an interesting comparison on the efficacy of the IBC in improving the recovery rate and in providing the lenders with a better realization in comparison to the erstwhile regime of recovery. The above indicates that the IBC is an evolving legislation, which has shown results in 2 years, especially in comparison to the erstwhile recovery and distress resolution framework. The realization proceeds under the corporate resolution framework of the IBC has also proven to be higher in comparison to the realization value under the previous framework (the graph above shows that the recovery percentage under the previous framework for the year 2017-18 was 12.4 % approx. whilst it has been at approx. 41.3% under the IBC). Out of the “Dirty Dozens”,1 Jyoti Structures and Lanco Infratech did not receive the approval of its committee of creditors for a resolution plan and consequently, have faced liquidation (though the order against Jyoti Structures has been temporarily stayed). Whilst lenders in such cases have refused to take steep haircuts, we have seen cases such as the bid by Reliance Industries – JM Financial for Alok Industries where the lenders have agreed to take more than 80% haircut. However, the rate of recovery for those accounts which have been resolved is encouraging. As on September 30, 2018, out of 1198 corporates undergoing insolvency resolution process, 52 corporates had received approval for their resolution plans under the IBC. The percentage of the amounts realized by the lenders vis a vis the total admitted claims (claims accepted by the resolution professional under the IBC post the submission of proof of claims of outstanding debt by the financial creditors) range from 100% (Concord Hospitality Pvt. Ltd.) to 0.28% (Zion Steel Limited) whereas the percentage of amounts realized vis a vis the liquidation value2 ranged from 29.58% (Rajpur Hydro Power Private Limited) to 375.83% (Dooteriah & Kalej Valley Tea Estate Pvt. Ltd.). A majority of the cases have seen more than 100% of the liquidation value being realized by the creditors. Since the liquidation process typically involves the sale of assets on a stand alone basis, the liquidation value provides the estimated realizable value of each asset of the corporate debtor. The above mentioned data indicates that the corporate insolvency resolution process has led to a better rate of recovery in comparison to (1) the erstwhile regime of recovery and (2) the amounts that would have been realized in case of a potential liquidation or a standalone sale of such assets through enforcement of security interest by individual creditors outside the IBC process. It is imperative that we have more examples of efficient resolution (which includes successful implementation of the resolution plans) such as the resolution of Bhushan Steel by Tata Steel, since the time value of money is an important consideration to ensure the efficacy of the IBC framework. Whilst steep haircuts still remain an important issue, a strong market for the growing investor appetite in the corporate resolution space should help in lowering the haircuts that the lenders are currently bearing. An important example would be the case of Binani Cements (which saw a stiff competition between Ultratech and the Dalmia Group with the winning bid providing for a 100% recovery for the creditors) and Essar Steel (where the promoters are offering a bid which provides 100% recovery for the creditors even after the bid submitted by Arcelor Mittal has been accepted), where competitive bidding has assured high realization value of the distressed account for the lenders. The IBC has reinvigorated the stressed asset space with both strategic as well as financial investors being bullish about the prospects of investment. In order to ensure continued momentum, it is important to constantly invest in capacity building. We need to have more officers assigned to NCLT as well as more benches of the NCLT and NCLAT. The IBC should not be used as a method to recover outstanding dues, however, with the low threshold for filing cases and the limited scope of review, it has become the favorite method for small operational creditors to recover their dues, thereby clogging the system. A holistic view of the situation augers well for the creditors as well as investors, with many more recoveries and resolutions on the anvil. Like any other nascent legislation, the IBC also has its own deficiencies, however, the IBBI and the government have been constantly trying to plug the gaps and introduce practical amendments which reduce the possibility of litigation and make the entire process fairer to each participating stakeholder. Reduction in the voting threshold of the CoC from 75% to 66% for certain key decisions such as appointment6 or replacement7 of resolution professionals, extension of insolvency resolution process8, approval of resolution plan9 etc. An explanation to the definition of ‘financial debt’ was added, whereby any amount raised from allottees under a real estate project (including home buyers) will be considered as a financial debt. This implies that home buyers who were earlier put under the bracket of “other creditors”, will now be considered as financial creditors and can now be a part of the CoC. The Second Amendment Act has further exempted some of the categories of resolution applicants from certain disqualifications under Section 29A to widen the pool of potential bidders. The Amendment has widened the definition of ’financial entities’ which now also includes AIFs.16 As per the amendment any financial entity which becomes a related party solely by way of conversion of debt or subscription to equity linked instruments before the insolvency commencement date will not be considered as a related party and will not be disqualified. Further, any entity which has acquired an NPA through the insolvency resolution process under the IBC will not be disqualified from making another acquisition under the IBC for the next three years. Model timeline to streamline the Corporate Insolvency Resolution Process (“CIRP”) and clarify certain ambiguities and overlapping timelines under the unamended CIRP18. Procedure and time limit for withdrawal of the CIRP under Section 12A of the IBC19. Process and format for invitation of Expression of Interest (“EoI”) to participate in the CIRP and timeline for submission of the EoI20. Statutory backing for automatic rejection of EoIs21 and resolution plans22 submitted beyond the prescribed timeline. This deemed rejection of submissions can ensure a fairer process by restricting resolution applicants from revising their plans after analyzing bids submitted by their competitors and also ensure a timely completion of the CIRP. The IBBI (Insolvency Resolution Process for Corporate Persons) (Fourth Amendment) Regulations, 2018 (“Fourth Amendment Act”) provide that operational creditors would have to be paid on priority over financial creditors under a resolution plan. This pay out mechanism replaced the previous waterfall which provided for payment of (a) resolution professional costs and (b) liquation value due to operational creditors and dissenting financial creditors in priority to financial creditors. Therefore, the Fourth Amendment has effectively done away with the requirement to pay the liquidation value due to dissenting financial creditors in priority23. Consequently, dissenting financial creditors can be paid the same amount and in the same manner as approving financial creditors. The IBBI (Liquidation Process) (Second Amendment) Regulations, 2016 (“Liquidation Amendment Act”)24 clarified that assets subject to security interest cannot be sold in liquidation proceedings unless the same have been relinquished to the liquidation estate25. Section 52 of the IBC, provides every secured creditor the right to relinquish its security interest over assets and participate in the liquidation proceedings, or realize the secured assets as provided under law. As per the Liquidation Amendment, if a secured creditor does not relinquish its assets then such assets cannot be sold during the liquidation process. Therefore, it is possible that even a single lender holding a pari passu charge over assets might be able to scuttle attempts to sell entire verticals of the business or the corporate debtor as a whole. The Insolvency Law Committee ("ILC") has submitted its second report to the Government, recommending amendments to the IBC to include provisions on cross border insolvency ("Proposed Amendment") based on the UNCITRAL Model Law26. The Proposed Amendment seeks to incorporate the four major tenets from the UNCITRAL Model Law, namely, (a) direct access to foreign insolvency professionals and foreign creditors to participate in or commence domestic insolvency proceedings against a defaulting debtor; (b) recognition of foreign proceedings & provision of remedies; (c) cooperation between domestic and foreign courts & domestic and foreign insolvency practioners; and (d) coordination between two or more concurrent insolvency proceedings in different countries. The Proposed Amendment would increase the access of Indian creditors to foreign assets and proceedings and vice versa, thereby strengthening the IBC regime and increasing investor confidence. However, there can be some challenges in the implementation and enforcement due to certain procedural gaps (dealt with in detail in our write up on the Proposed Amendment). The year saw a lot of interesting judicial pronouncements which contributed to the development of the IBC regime. The central theme for most of these judgments is (a) effective implementation of the Code (b) maximization of value for all stakeholders, i.e. creditors, investors and shareholders (c) fair and equitable treatment of all creditors irrespective of categorization and (d) defending against subversion of the spirit of the Code through innovative measures. Some of the key judicial pronouncements are discussed below. The eligibility criteria as specified under Section 29A of the IBC applies to a resolution applicant and any person/entity acting jointly or in concert with such resolution applicant fulfilling certain requirements. In the case of ArcelorMittal India Private Limited & Others v. Satish Kumar Gupta & Others,27 the Supreme Court explored the provision set out under Section 29A of the IBC and found that Section 29A requires the lifting of the corporate veil. Accordingly, the Supreme Court held that basis the facts of the case, it can be deduced that if certain persons were acting jointly in a manner so as impute that such persons were acting together then such persons will fall under the expression of “persons acting jointly”. In addition, while the phrase “persons acting in concert” has not been specifically defined under the IBC, the Supreme Court, while taking into consideration precedents and existing laws, held that the phrase shall have the same meaning as assigned under the SEBI Takeover Code. The Supreme Court also discussed the meaning of the terms “management” and “control” under Section 29A where it held that management refers to de jure management of the corporate debtor and “control” will only cover positive or proactive control and not any sort of negative or reactive control. In addition, the Supreme Court also examined the issue of whether a resolution applicant may avoid falling within the ineligibility criteria as per Section 29A, accordingly, the Supreme Court applied a look back approach and held that while the credentials of a resolution applicant as on the date of submission of the resolution plan may be considered, past actions which may be proximate and relevant to the current resolution plan may also be considered. IBC devolves certain powers on the Adjudicating Authority to nullify or reverse the effect of certain transactions carried out for the purpose of undermining or circumventing any of the provisions of the Code. The NCLT, Allahabad in the case of IDBI Bank Ltd. v. Jaypee Infratech Ltd,28 held that mortgages created by Jaypee Infratech Ltd. (“JIL”) in favour of the lenders of its holding company Jaiprakash Associates Ltd. (“JAL”) amounted to preferential, undervalued and fraudulent transactions. Upon finding that the transactions were fraudulent, undervalued and preferential, the NCLT ordered the release of the encumbered lands from JAL’s lenders, and directed that they be vested back in JIL. JIL mortgaged its land without any consideration or counter-guarantee from JAL. The above judgment has been stayed by NCLAT while it is seized of the appeal. The NCLAT in the case of Jagmohan Bajaj v. Shivam Fragrances Pvt. Ltd & Anr,29 held that triggering of CIRP cannot be defeated by taking resort to pendency of internal dispute between Directors of Corporate Debtor on allegations of oppression and mismanagement. IBC is a special law having an overriding effect on any other law as mandated under Section 238 of IBC. The statutory rights of financial creditors therefore, cannot be made subservient to pending proceedings under Section 241 and 242 of the Companies Act, 2013 (Oppression and Mismanagement). The Supreme Court in the case of K. Kishan v. Vijay Nirman Company Pvt. Ltd.30 clarified that operational creditors cannot use IBC either prematurely or for extraneous considerations or as a substitute for debt enforcement procedures. It held that filing a Section 34 petition under Arbitration and Conciliation Act, 1996 (“Arbitration Act”) against an arbitral award shows a pre-existing dispute that concludes its first stage in the form of an award, and continues thereafter, till final adjudicatory process under Sections 34 and 37 of the Arbitration Act has taken place. Therefore, IBC proceedings cannot be initiated till all available statutory appeal mechanisms have been exhausted by the parties. In the case of Leo Edibles & Fats Limited and The Tax Recovery Officer (Central), Income Tax Department, Hyderabad and other31, the High Court of Telangana dealt with the issue of settling the dues of the Income Tax authority during liquidation of the company. The High Court held that in the event that the assesse company is undergoing the liquidation process under the IBC, the Income Tax authority can no longer claim a priority in respect of clearance of tax dues under the IT Act. The High Court further held that assets that are under attachment (though encumbered) will not create any interest in favour of the Income Tax authority as a secured creditor under the IBC. Additionally, the High Court further set out that the moratorium in terms of proceedings as set out under the IBC ensures that any pending litigation initiated prior to commencement of the insolvency proceeding are suspended. Accordingly, assets under an order of attachment issued prior to liquidation commencement shall be sold along with the other unencumbered assets of the assesse company. The Supreme Court in the case of State Bank of India v. V. Ramakrishnan & Anr.34 held that, moratorium under Section 14 of the IBC does not intend to bar actions against assets of guarantors in respect of recovery of the debts of the corporate debtor. The scope of the moratorium may be restricted to the assets of the corporate debtor only. Enforcement of guarantee entails a shift of the right of the creditor against the principal debtor to the surety. Thus, contractual principles of guarantee require being respected even during a moratorium. The NCLAT in the case of Binani Industries Limited v. Bank of Baroda & Another,35 held that the resolution plan submitted by Dalmia was discriminatory in nature due to the disparity in treatment of similarly placed financial and operational creditors. Additionally, the NCLAT also held the importance of maximisation of assets over procedural compliance. Therefore, the NCLAT ruled that unintelligible discrimination between similarly placed creditors would result in a resolution plan being invalidated by the Adjudicatory Authority. The NCLT, Principal Bench, in the case of Vedika Nut Crafts Pvt. Ltd.,36 held that the CoC cannot jump to seeking liquidation without inviting EoI by the prospective resolution applicant. Such a decision would be arbitrary and fall foul of legal provisions and fair play. It is the duty of Resolution Professionals to invite an EoI. In absence of an EoI there would be no possibility of any resolution applicant to come forward and make an offer. NCLAT in the case of Usha Holdings LLC. & Anr. v. Francorp Advisors Pvt. Ltd.,37 held that the Adjudicating Authority under IBC is not a ‘Court’ or ‘Tribunal’ and ‘Insolvency Resolution Process’ is not a litigation. Accordingly, NCLT has no jurisdiction to decide whether a foreign decree is legal or proper. In this case, the appeal was filed against refusal of NCLT to admit a petition filed under Section 9 of IBC. The appellant’s claim of being an operational creditor was founded on default of the respondent company in complying with a money decree passed by a US Court. 1 Dirty Dozens refer to the top 12 accounts constituting 25% of the total non-performing assets, as identified by the Reserve Bank of India for immediate resolution under the IBC. These include: Bhushan Steel Limited; Electrosteels Steel; Monnet Ispat & Energy; Amtek Auto; Bhushan Steel and Power; Essar Steel; Alok Industries; Jaypee Infratech; Jyoti Structures; Lanco Infratech; ABG Shipyard; Era Infra Engg. 2 The liquidation value is the estimated realizable value of the assets of the corporate debtor if the corporate debtor were to be liquidated on the date of admission of the petition for corporate resolution under the IBC. 5 The statutory penalty under IBC in this regard being imprisonment of upto 5 years, or a fine of upto INR 1 crore rupees, or with both. 6 Section 22 (2) of the Insolvency and Bankruptcy Code, 2016. 7 Section 27 (2) of the Insolvency and Bankruptcy Code, 2016. 8 Section 12 (2) of the Insolvency and Bankruptcy Code, 2016. 9 Section 30 (4) of the Insolvency and Bankruptcy Code, 2016. 10 Section 12 A of the Insolvency and Bankruptcy Code, 2016. 11 Section 238A of the Insolvency and Bankruptcy Code, 2016. 12 Section 29A (c) of the Insolvency and Bankruptcy Code, 2016. 13 The case has been discussed in detail under section IV. 14 Section 29A (d) of the Insolvency and Bankruptcy Code, 2016. 15 Section 29A (i) of the Insolvency and Bankruptcy Code, 2016. 16 Explanation II, Section 29A of the Insolvency and Bankruptcy Code, 2016. 17 The Third Amendment Act notified on July 3, 2018 makes changes to the Insolvency and Bankruptcy Board of India (Insolvency Resolution Process for Corporate Persons) Regulations, 2016. 19 Regulation 30A of IBBI (Insolvency Resolution Process for Corporate Persons) Regulations, 2016. 20Regulation 36A of IBBI (Insolvency Resolution Process for Corporate Persons) Regulations, 2016. 21 Regulation 36A(6) of IBBI (Insolvency Resolution Process for Corporate Persons) Regulations, 2016. 22 Regulation 39(1A) of IBBI (Insolvency Resolution Process for Corporate Persons) Regulations, 2016. 23 Regulation 38 of IBBI (Insolvency Resolution Process for Corporate Persons) Regulations, 2016. 24 This Amendment made changes to the Insolvency and Bankruptcy Board of India (Liquidation Process) Regulations, 2016 on October 22, 2018. 25 Regulation 32 of IBBI (Liquidation Process) (Second Amendment) Regulations, 2016. 26 See report at, http://www.mca.gov.in/Ministry/pdf/CrossBorderInsolvencyReport_22102018.pdf. 27 CA No. 9402 – 9405 of 2018. 28 CA No.26/2018 in Company Petition No.(IB)77/AD/2017. 29 CA (AT) (Insolvency) No. 428 of 2018. 30 CA No. 21824 of 2017. 31 Writ Petition No. 8650 of 2018. 32 CA (AT) (Insolvency) No. 61 of 2018. 33 See Also, Export Import Bank of India v. Resolution Professional, Company Appeal (AT) (Insolvency) No. 304 of 2017 (NCLAT). 34 CA No. 3595 of 2018. 35 CA (AT) (Insolvency) No. 82 of 2018. 37 Civil Appeal (AT) (Insolvency) No. 44 of 2018.